Have you already signed up for the upcoming Interest Group in Agricultural Data (IGAD) Pre-meeting? and addresses the theme ‘The Digital Frontiers of Global Science’ (Keynote Speakers - International Data Week 2018 confirmed). You can officially express your desire to attend and actively participate in the IGAD RDA P12 Pre-Meeting by writing to AIMS@fao.org (Subject: IGAD RDA Botswana 2018). Register now to get involved in the IGAD data-related conversation and ask the hosts some questions of your own! You will receive an acknowledgement of your mail and will be provided with logistic details on how you can attend the meeting. … not only gain/enhance/consolidate (new) knowledge about data management/access/interoperability trends, projects, challenges and perspectives, but, also be actively involved in a number of live discussions about data collections in Africa and beyond! Following the previous IGAD event dedicated to FAIR data guiding practices in agricultural and related sectors, the panellists will explain the efforts and achievements of their communities in adopting and promoting best practices in FAIR data collection creation and re-use, as well as in addressing some of the challenges concerning ownership, licensing, and sharing of the data that is being collected. We are sure that the IGAD Pre-Meeting P12 will be a unique opportunity to address a number of data issues related to African Agriculture, Agribusiness, Agricultural Economics, Soil protection, soil rehabilitation, wheat, climate change, weather and other data-related topics, impact assessment of data policy interventions for food security, just to name a few of the themes that have already been put on the ‘IGAD in Botswana’ Agenda. - to aid in data collection and interoperability and to prompt data usage in the research and industry areas. It is our outmost belief that the approaching IGAD Pre-Meeting will be indeed a great opportunity to participate and share your expertise on the major issues focused on data collection, processing, interoperability and re-use, and that the upcoming event’s program (to be announced soon!) will help build a resilient and reliable open data to a great extent. (iii) share straightforward and low cost data collection methods. (3) capacity development as a mechanism to leverage and extend the potential of networks. (2) infomediaries (i.e. technology specialists, librarians, journalists, communication officers etc.). To amplify these IGAD community voices, we will be talking to the panellists about their concluding thoughts and key findings from the plenary session. Join the world’s leading data experts for presentations and discussions on the most pressing data issues in agriculture and related sectors! We are looking forward to seeing You at the IGAD in Botswana meeting! 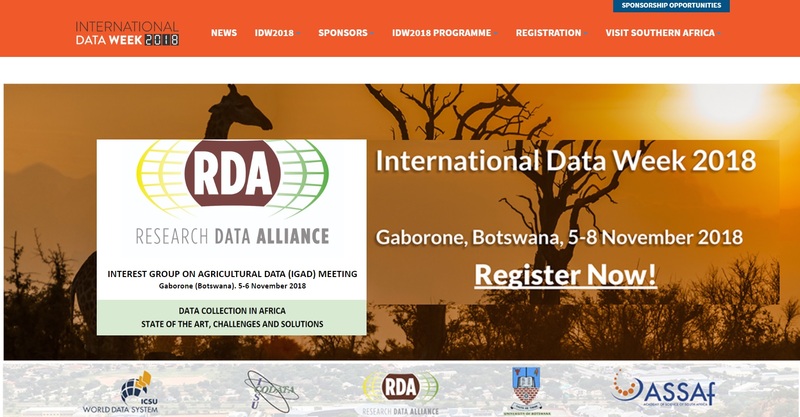 Registration is now officially open for International Data Week 2018 (IDW 2018) in Gaborone, Botswana from 5-8 November 2018. Take advantage of early bird pricing by registering at the link below prior to 30 September 2018. Reduced pricing is also available for students and attendees originating from and who are also based in low and middle income countries. IDW 2018 will be a rich week of science and data, filled with plenary sessions and panel discussions featuring many renowned international data experts! And, thanks again for your interest!